One of the major advantages to working with zebrafish (Danio rerio) is that their genetics can be easily manipulated by microinjection of early stage embryos. Using this technique, solutions containing genetic material or knockdown constructs are delivered into the blastomeres: the embryonic cells sitting atop the yolk of the newly fertilized egg. Delivery into the cytoplasm is achieved either through direct injection into the blastomere, or via natural cytoplasmic movements that occur after a solution is injected into the yolk. Successful genetic manipulations are usually followed by quantification of embryonic phenotypes in order to elucidate the genetic mechanisms of development. This video will provide an introduction to carrying out microinjections in zebrafish embryos. The discussion begins with a review of the essential tools for the technique, including the injection apparatus and the microinjector, which controls fluid movement with pressure pulses of air. Next, important preparatory steps are demonstrated, such as the pouring of agar plates to stabilize embryos during injection and calibration of the microinjection apparatus. The injection procedure is then presented along with tips on when and where injections should be performed. Finally, applications of the microinjection technique are discussed, including gene overexpression via mRNA injection, gene silencing by delivery of antisense morpholino oligonucleotides, and the generation of transgenic zebrafish using specially engineered plasmid DNA. JoVE Science Education Database. Biology II: Mouse, Zebrafish, and Chick. Zebrafish Microinjection Techniques. JoVE, Cambridge, MA, (2019). Microinjection of zebrafish embryos allows researchers to deliver solutions directly into the developing animal, in order to study gene function and developmental dynamics. Embryos from the 1 to 4-cell stage are frequently used for injection. Because there are no membranes separating the cells and the yolk at this early stage, solutions injected in either one cell or the yolk will evenly spread throughout the organism. By using microinjection, protein production genes can be expressed, or turned off, depending on the type of material injected. This video will demonstrate pipette preparation, embryo collection, the microinjection procedure, and discuss some of the ways this technique is used in labs today. First, let’s cover the major components of the microinjection system: The stereoscope, microinjector, pipette holder, and micromanipulator. The microinjector delivers precise volume through pressure pulses of air, which can be adjusted by the user. The pipette holder secures the pipette for use during the procedure and connects it to the airline of the injector. Typically, the pipette holder is placed in a micromanipulator. This instrument allows the researcher to make small and accurate adjustments to the pipette location during the injection procedure. A foot pedal is connected to the injector and allows the researcher to maintain use of their hands while simultaneously activating the pressure pulse for injection material delivery. 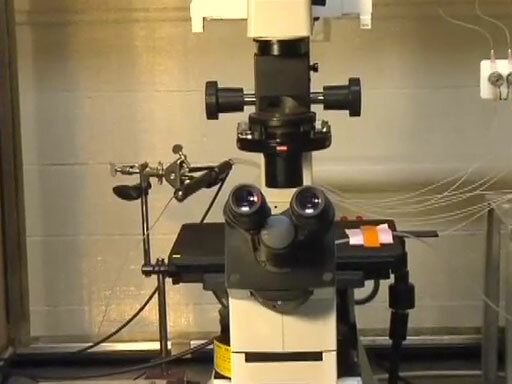 Finally, the stereoscope allows the researcher to see the embryos and focus on the location of the pipette during the microinjection procedure. Before microinjection can begin, glass needles must be prepared. Microinjection needles must be of a consistent size to allow for precise delivery of injection materials. A pipette puller helps ensure fine and sharp pipettes are prepared every time. The puller heats a glass capillary tube while exerting force that pulls on the tube, resulting in two pipette needles. Under the microscope, using forceps, the tip is cut off in a manner that allows for a consistent volume of liquid to be delivered, yet maintains the sharpness of the needle for piercing the zebrafish embryo. Phenol red, a dye used to help visualize the injection procedure, can be mixed with the injection solution in order to track successful injection into the embryo. Needles can be loaded with injection solution from the tip side via capillary action, or they can be backfilled with a microloader syringe. Once the needle is loaded for injection, it can be inserted into the pipette holder on the micromanipulator. After the injection needles are ready, the microinjector pressure and time settings are adjusted in order to calibrate each needle, which will ensure a consistent volume is delivered to each embryo. Under the stereoscope, a small amount of solution is injected into a drop of mineral oil on a slide. The size of the droplet is measured and the volume that the needle disperses can be calculated. Subsequently, the pressure of the microinjector can be further adjusted and the process repeated until a droplet of the desired size is regularly obtained. Once needles are prepared and calibrated, embryos are obtained and arranged for injection. 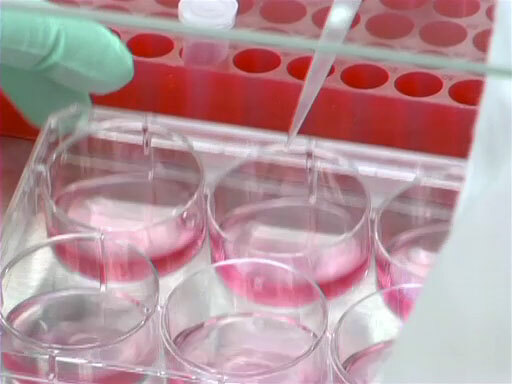 Once they are in position, the embryos are ready to be injected. Embryos can be injected either into the yolk or cell cytoplasm. Injection into the yolk is simpler and requires less sophisticated injection technique, while injection into the cytoplasm is more difficult, but yields more robust results. 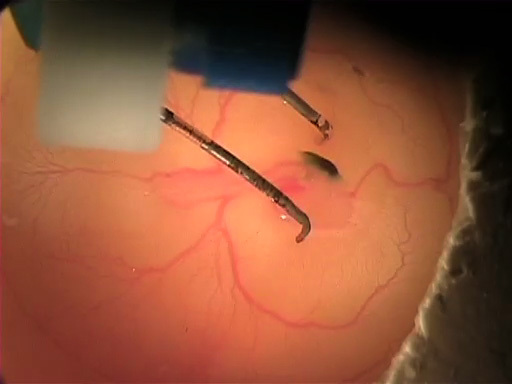 To inject into the yolk, use the micromanipulator to move the needle so that it pierces the chorion and then the yolk. The foot pedal is then tapped to cause the contents of the needle to be expelled into yolk. Cytoplasmic flow and diffusion allows the injection solution to flow into the cell. Injection into the cytoplasm requires careful positioning of the embryo, so that the cytoplasm can be effectively targeted. Following injection, embryos are transferred to a new dish and incubated at 28.5 °C. 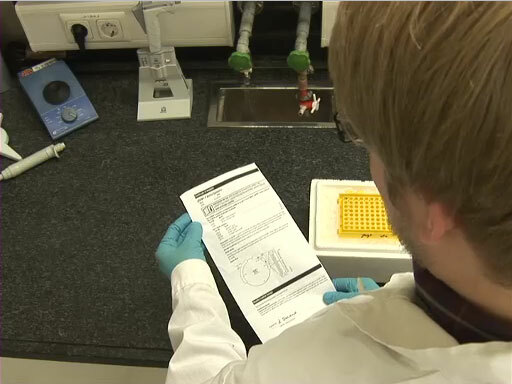 They are frequently checked to remove dead embryos. To determine the success of the injection, embryos can be analyzed based on their overall appearance, the presence of a fluorescent marker, and by looking for changes in their genome using genotyping. Now that you understand how to inject zebrafish embryos, let’s look how scientists can use this technique to understand the function of genes. First, scientists can inject synthesized mRNA to overexpress certain genes and determine their function by observing phenotype. This same technique can also be used to express proteins that highlight molecular events, such as the cytoskeletal rearrangements that occur during development. Second, genes can be turned off by the injection of morpholinos. Morpholinos are stable synthetic nucleic acid analogs that can be designed to bind to specific mRNA sequences by standard nucleic acid base pairing, and block translation. In turn, this leads to loss of the protein produced by that mRNA. This effect allows researchers to understand the role of a particular gene in development by seeing how development is altered in its absence. Injection can be used to incorporate foreign DNA into the zebrafish. By injecting sequences containing recognition sites for DNA modifying enzymes, scientists can efficiently generate "transgenic" fish with modified genomes, meaning that foreign genes will be passed on to future generations. Depending on the sequence design, gene expression can be confined to specific tissues or specific developmental timepoints. You’ve just watched JoVE’s introduction to microinjection of early zebrafish embryos. This video has introduced the microinjection setup, demonstrated how to prepare microinjection needles, shown how to prepare embryos for microinjection, perform the microinjection technique, and some applications of microinjection. As always, thanks for watching!